This is a 2 minute read. With Coverings 2012 just around the corner, it seems timely to introduce you to the P.A.T.T.I Blog for this Social Flooring Index Blog Review. P.A.T.T.I. stands for Professional Attention to Tile Installation. It's an internationally renowned training & consulting firm specializing in all facets of ceramic tile & stone. P.A.T.T.I is also synonymous with Patti Fasan, a dynamic and passionate tile speaker whom I first heard at Coverings 2010 [or possibly at an earlier Surfaces]. I was delighted to come across Patti's blog, which is managed by Ryan Fasan. The P.A.T.T.I. 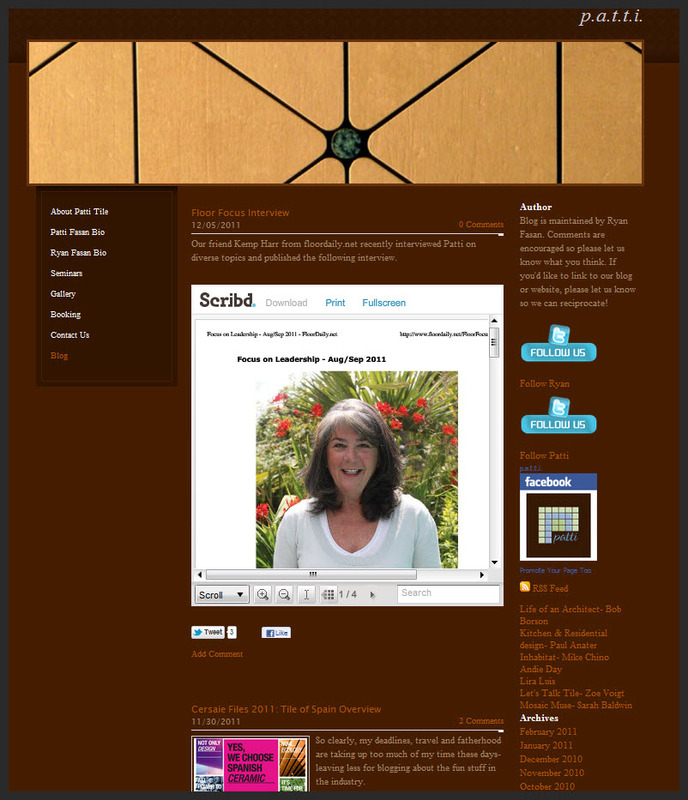 Blog's first article, titled For the Love of Tile, was published on January 29, 2010. Early articles are visual, but succinct as Ryan developed his 'voice'. Later articles offer spectacular images [see Teruel Existe!] and accounts of tile related travels [see Stone from Spain Chronicles]. These blog articles truly communicate the intensity of Ryan's and P.A.T.T.I. 's passion for design and tile. I can't get over the images in Cersaie Files 2011: Tile of Spain Overview. Can you imagine if North America were home to trade shows such as these? I love the glimpse into Ryan's non-tile life and his celebration of the birth of his daugher. The P.A.T.T.I blog is definitely a warm and engaging space! I also applaud the use of rich content tools such as YouTube and Scribd. The blog's sidebar includes links to Patti Fasan on Twitter and Ryan Fasan. It includes mention of Facebook and blog article categories for easy exploration. I was so pleased to notice that details a blogroll lists with marvelous contributors to conversation about tile and stone [e.g., Zoe Voigt] and design [e.g, Andie Day]. Exploring the P.A.T.T.I. blog made me feel as if I had gone on a marvelous visual adventure. In fact, I want more! Include an email subscription form so others can keep up via email updates on the wonders shared. Include in the blog sidebar a Twitter widget capturing Patti and Ryan's engaging Twitter conversations. Publish more frequently! Your last article was in December... and I want to see more! Congratulations, Ryan and P.A.T.T.I. Blog for sharing so many tile wonders with us! I look forward to reading and experiencing more! What do you like most about the P.A.T.T.I. Blog? Let me know in the comments.